Allergy natural remedies and home remedies for allergies include the use of herbs, homeopathy, nutritional supplements, and aromatherapy. An allergic reaction occurs when your immune system misinterprets a foreign but normally harmless substance (such as pollen, grass, certain food, etc.) as a harmful invader. The immune system responds to this perceived threat, known as an allergen, by producing proteins known as IgE antibodies. Normally, in the case of an actual threat such as a flu virus, these antibodies work to protect you from these virus that could make you sick or cause an infection. However, in the case of an allergy, these antibodies look upon the allergen as harmful (even though it is not) and triggers the release of histamines and other substances that cause allergy symptoms. Histamines produce various bodily reactions that involve your skin, sinuses, airways or digestive system, such as respiratory and nasal congestion, increased mucus production, skin rashes and welts, diarrhea, and headache. Common allergens can be found in the environment, such as pollen, dust, mold, pet dander, and so on. Allergens can also be found in food, particularly peanuts, wheat, soy, fish, shellfish, eggs and milk. 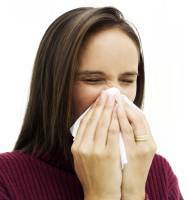 Usually, when the environmental allergens are removed, the allergic symptoms go away. However, if the allergens are not removed, the immune system will continue to produce histamines and the allergic symptoms will worsen which may result in chronic sinusitis (sinus infection). It remains unclear as to why some people develop allergic reaction to certain allergens while others are unaffected. One possible reason may be due to genetics. Another reason may be due to stress and a compromised immune system. Just as we may have allergic reactions to different types of allergens, the symptoms of allergies are also different depending on the type of allergens causing the reaction. Anaphylaxis is a kind of allergic reactions that are life-threatening. A person who is having this kind of reactions must receive medical treatment within about 30 minutes. Conventional medications for allergies can include over-the-counter or prescription medications in the form of oral medications, nasal sprays or eyedrops. Oral allergy medications include corticosteroids, antihistamines, and decongestants. For severe allergies or allergies not relieved by other treatment, some people go for allergy shots (immunotherapy). These conventional treatments can reduce allergy symptoms but can also have side effects such as drowsiness, headache, and dry mouth. Allergy natural remedies involve the use of herbal remedies and nutritional supplements, as well as homeopathic remedies and aromatherapy. These are milder and more gentle on our bodies. However, natural allergy remedies may take longer to be effective, so if you are suffering from seasonal allergies such as hay fever, be sure to start taking allergy natural remedies one or two months before the allergy season starts. Vitamin C: High levels of vitamin C help reduce histamine release and also make histamine break down faster once it is released. In addition, vitamin C is anti-inflammatory and may help dampen some of the inflammation associated with chronic allergies. However, for vitamin C to be effective against allergies, you need to take it before you are exposed to the allergen. It is best to take the slow-release form of vitamin C (i.e. ester-C or calcium ascorbate), 500 to 1,000 mg twice a day. MSM: MSM (Methyl-Sulfonyl-Methane) has been found to be effective in providing fast relief from hay fever symptoms. Its effectiveness is due to it's ability to block the receptivity of histamine in the sensitive tissue of the mucus membranes of nasal passages. This process is believed to prevent the histamine from creating the inflammation, swelling, and fluid build-up that can come with allergies. You can take 3000 to 5000 mg of MSM daily. Essential Fatty Acids: EFAs can reduce inflammatory responses associated with allergies. You can take one to two tablespoons of flaxseed oil a day. Stinging Nettle: Research shows that the herb nettle can effectively treat allergic nasal symptoms, such as runny nose, nasal congestion, coughs, etc. Many people have reported positive results in using nettle to treat hay fever. Garlic: Garlic has anti-inflammatory effects because it contains high concentrations of compounds such as quercetin. If you have allergies, use lots of garlic in your cooking. Alternatively, take garlic pills daily. Ginkgo: The ginkgo leaf extract contains several substances (ginkgolides) that interfere with the action of a chemical, platelet-activating factor (PAF), produced by the body. PAF plays a key role in triggering allergies, asthma and inflammation. If you have allergies, you can try 60 to 240 mg of the standardized ginkgo extract daily. Homeopathic remedies are effective allergy natural remedies as well. They usually can provide fast relief. For a remedy to work, you need to select the remedy that most closely matches the symptoms. Use a lower potency (6X, 6C, 12X, 12C, 30X, or 30C) and follow the instructions printed on the label. Allium Cepa: This remedy is for people with watery eyes and a clear nasal discharge, along with sneezing and a tickling cough. The symptoms tend to get better in fresh air. Arsenicum Album: This remedy is for people with burning eyes, watery, runny nose with a stuffy, tickling feeling during allergy attacks. Swelling below the eyes and a wheezy cough are common. This remedy is good for the highly sensitive person with many allergies. Euphrasia: This remedy is for red, burning, swollen eyes which are irritated with acrid tears or pus. Gelsemium: This remedy is indicated if a person has a tired, droopy feeling during allergies with a flushed and heavy-feeling face. The person may feel the swollen membranes inside the nose. Or alternatively, the nose may be runny and the person may sneeze frequently. Nux Vomica: This remedy is for people with diverse allergy symptoms, such as a stuffed-up nose when outdoors or at night, and a runny nose when indoors and in the daytime. Other symptoms include a teasing cough, a tickly feeling in the throat, and headache. People who need this remedy may often wake up sneezing; they tend to feel impatient, irritable, and chilly. Sabadilla: This remedy is for people who have many repeated sneezes in a row, an itching and runny nose, a feeling of a lump in the throat, and watery eyes. The person may feel nervous during allergy attacks. You can use any of these oils in a steam inhalant or a bath or a diffuser. For skin allergies such as hives and itching, you can use Chamomile oil to massage the affected area.